I'm not really sure what happened, but my iPhone no longer plays any videos that have to load from the Internet. That includes Netflix, Huluplus, safari, Chrome, YouTube, and anything else that streams. I'm with an iPhone XS. I noticed about a week ago that my iPhone XR ios 12 is not playing video of any kind. When the movie is about to start I get the black screen but then I get the play button with a circle and a line in it (like the no-smoking sign). Any suggestions? Have you ever got into the trouble of videos not playing on iPhone XS/XS Max/XR/X/8/7/6s/SE/6? For instance, you might get the spinning wheel or black screen while playing videos on iPhone, or even your iPhone "hang", "freeze", or skip in the middle of some video clips. 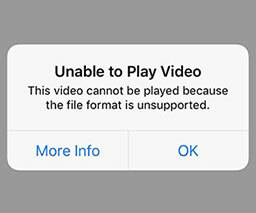 These are common video playback problem iPhone users may experience. So what is causing the video playback problem on iPhone? If you find some specific videos that are not playing on iPhone, below we are showing how to go about the problem when iPhone won't play videos. Reason #1: Frequently, you may find your videos play without a problem on your Android phone or other mobile devices, but your iPhone won't play the videos or the files won't show up in your iPhone. The most probable cause is that the videos are in the formats that are unrecognized by your iPhone. You need to convert videos into a format that the iPhone can play. Generally, iPhone plays videos in H.264 & MPEG4 in .m4v, .mov, .mp4 file formats. You can check the full list of iPhone supported audio/video formats. If the video files are not in the list, please resort to video converters like MacX Video Converter Pro to do some transcoding beforehand. Free download the Mac video converter (or for Windows) - Load video - Choose iPhone XS/XS Max/XR/X/8/7 as output format - RUN! Reason #2: In most cases, if you find your YouTube videos on iPhone not playing with a message "playback error tap to retry", you shall be aware that this arises from other apps or low memory. Rebooting your device helps to fix the issue. Solution: To get rid of the problem, just press and hold the sleep/wake button until the red slider shows up, drag it and turn off your iPhone. Then press the button to turn on it. Reason #3: Cache and cookies are also responsible for iPhone won't play videos online issue. If so, clearing them can solve the problem and even speed up iPhone , so that you will be able to watch videos on your iPhone fast without any interruption. Reason #4: Some faulty apps may also bring about iPhone videos not playing error. So to delete the possible faulty apps you have installed recently may help tackle the issue. 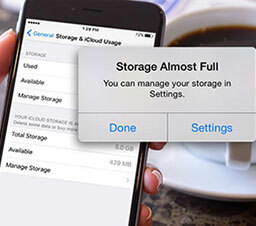 Note: Uninstalling some apps also help to free up iPhone storage. 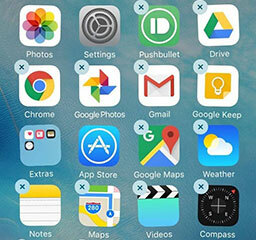 Solution: Navigate the app on the home screen, press on the icon until an X shape appears, click on it to delete the app. Reason #5: Check if the videos are corrupt or damaged. Mostly, corrupted videos cannot be played on iPhone, which may hang or freeze constantly in the middle of a particular video. If you've ever faced with the same problem, just follow the tips below. * Delete the damaged or corrupted video file if the iPhone playback error happens with a particular video. * Remove the corrupted sector using a iPhone video editor. * Download the correct videos that work fine with iPhone. See how to download full-length movies to iPhone (XS/XS Max/XR/8/7/6S included). Note: If multiple videos are not playing on iPhone from different sources, you can restoring your iPhone as this helps in many situations. This is also the last option for you to solve videos not playing on iPhone problem since restoring iPhone will delete all the data on it. So make sure to backup data to iPhone before restoring it. Whether your YouTube videos or other online videos are not playing on iPhone or you want to get your damaged videos or unsupported videos, e.g. 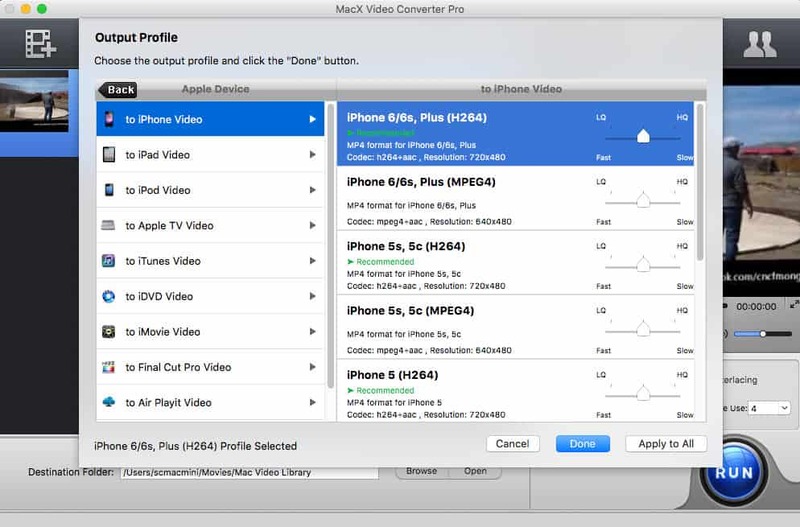 MKV file, played on iPhone flawless, here is a once-and-for-all solution - try MacX Video Converter Pro - free you from the complicated steps mentioned above. It is an expert on both online video downloading and converting. Supporting as many as 300+ online video sites and built in 370+ audio/video codecs and specific iPhone device profiles, you can easily download online videos from YouTube and convert any videos like AVI, MKV, MTS/M2TS, MOD, WMV, FLV, etc to meet the iPhone (XS/XS Max/XR) video playback needs. Therefore, you will never struggle with the videos not playing on iPhone problem. Just free download and install MacX Video Converter Pro on your Mac or PC and follow the steps to convert videos to iPhone as the fixes for videos won't play on iphone problem. If you are running on a PC, please switch to MacX Video Converter Pro for Windows. Step 1: Import the Videos That Are Not Playing on iPhone. Tap the Add Video button to add the video you cannot play on iPhone after you launch the iPhone video converter. Batch video converting is supported. You can add more than one video file at once. Step 2: Choose the Output iPhone Profile. When a pop-up window of Output Profile appears after the video loading, you can go to Apple Device -> to iPhone Video -> select the specific iPhone model such as iPhone XS/XS Max/XR/8/7/6S as the output format. Note: There are still other preset profiles listed, including iPhone XS/XS Max/XR, iPad Pro, Samsung Galaxy S7, iTunes, Apple TV, etc. Plus, it's great regarding to its video editing feature. You can cut off the corrupted video clips to repair the slightly corrected file if the video won't play on iPhone. Step 3: Start iPhone Video Conversion. Tap the Browse button to save the video in the destination folder and tap RUN button to start converting videos to iPhone. After the conversion, you can sync the video to iPhone and then even play HEVC video on iPhone without trouble.